Most of the students search on Internet or Job Newspaper for Examination date. Don't worry we solve this problem. Here you can get all upcoming West Bengal Govt Job Exam date. West Bengal Govt Exam date is valuable for all the Bengal Students Also, you can get all practice set, syllabus, previous year Exam paper from our website. 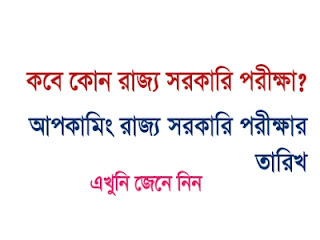 Today GK Solve share All upcoming West Bengal Govt Job Exam Date. Its helpful to all the Job aspirant Of Bengal. So we requested to all the Aspirant to read carefully this post.